Great news, we won an award last week at Museums and the Web, a major annual conference for museums and technology. The conference took place in Baltimore, USA, 2-5 April. 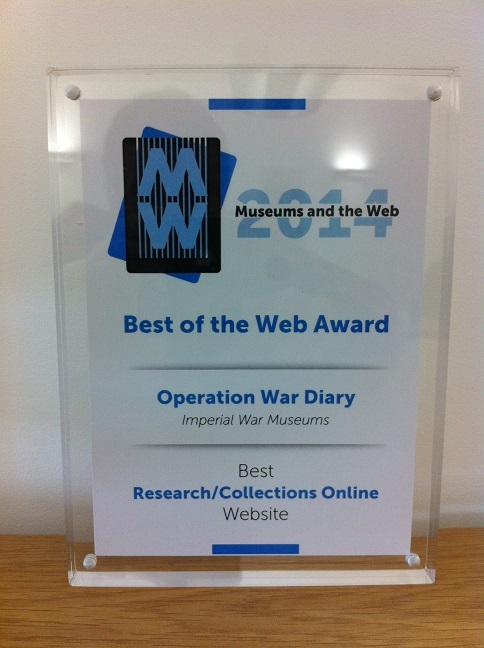 Operation War Diary won a Best of the Web award in the ‘Research / Collections Online’ category . It is usual practice to name and thank the people who made the project possible. However, Operation War Diary has been visited by over a hundred thousand people – all helping to spread the word and build our community of volunteers. Around 10,000 have already become Citizen Historians by classifying and tagging around 300,000 diary pages. A small number of volunteer moderators have been ably managing the Talk discussion forum. Thank you all! Operation War Diary is a collaboration between Imperial War Museums, The National Archives and Zooniverse. The tagging interface was developed by (the brilliant) Jim O’Donnell at Zooniverse. The award will live on his mantelpiece. Unfortunately, the Operation War Diary team are far too busy to attend the conference – maybe next year! The award was accepted by our colleague Carolyn Royston, Head of Digital Media at IWM – thank you Carolyn. Its time for an update on what’s we’ve been doing — there’s lots to tell. Our volunteers have been actively classifying and tagging pages over the last weeks – almost 300,000 of them since we launched the project in January. This is fantastic achievement and will enable a whole new understanding of the Western Front over the coming months and years. We owe you all a huge amount of thanks and so does anyone who cares about how the war is understood and remembered. We all owe particular thanks to the volunteer moderators who are answering queries, organising discussions and ensuring respectful converations on the Talk forum. So, what have we been doing since the project launched on January 14th….. The team have been heavily preoccupied with analysing the data from the first months of tagging. The aim is to produce sets of ‘consensus data’ from the classifications and tags submitted by volunteers. ‘Consensus data’ is a set of facts that describes the contents of each diary page, based on combining the work of several people (usually 5 per diary page). This is a complex task as diary pages are much richer in content than other Zooniverse projects and so the Operation War Diary data has unique challenges. We are getting close and soon we will be able to start sharing that data – for researchers and to historians to analyse. We will also share it with you online so you can see the fruits of the combined labour of our volunteers. We already know there are 10s of thousands of names in the diaries classified so far and that will be shared along with the other data. Volunteers have given us plenty of feedback about improvements they’d like to see. Many have already been added to the system. We will soon be releasing an updated version of Operation War Diary. The main changes that volunteers will notice will be the addition of new tags that properly describe the activities of specialist units and some tags we didn’t include in the initial system (e.g. counts of casualties). These features have been tested by volunteers (thank you again) and new help text has been created for the Field Guide. This will be released in the next couple of weeks – the system won’t look much different, but will enable more precise tagging. Everyone who served during Britain and the former Empire during the First World War will be part of this permanent digital memorial. The data generated by Operation War Diary volunteers will include hundreds of thousands of named individuals, including significant numbers of Other Ranks. These will be added to Lives of the First World War to be connected to their Life Stories. Creating Lives of the First World War is a major undertaking and requires significant ongoing effort from me and my IWM colleagues. This work will mean that the work done here by volunteers can be part of something much, much larger. We cannot over emphasise how deeply these projects relate to each other and how the work we are doing on Lives of the First World War contributes significantly to Operation War Diary by giving it an enduring purpose. Citizen History is about YOU! One area where we have not been as active as we would like is on the Talk forum here. There are a few reasons for this. Firstly, the level of effort being applied in the areas listed above leaves us little time for forum contribution. Secondly, the Talk forum is for everybody – it is intended for you and everybody else to discuss their findings in the diaries with each other. Or to seek collaboration on areas of focussed interest with other Citizen Historians. They are not intended as a means of conducting a one-to-one conversation with IWM or The National Archives. We are keen for professional historians from academia and elsewhere to join those conversations, but we are also very happy for it to be a space for Citizen Historians to engage with each other. It is not, and will never be, a museum enquiries service for Western Front history. We have made several efforts to engage academic historians with the Talk forum and we will continue to do so, but we do not wish to create the expectation that we will ever guarantee any level of response from us to your history enquiries. By reading the diaries, volunteers are gaining expertise themselves (of course many already have a great deal) – please take the initiative and conduct conversations with other Citizen Historians. If you have a query that has come up during your work on Operation War Diary, do not hesitate to also discuss it elsewhere. The Great War Forum is a fantastic, vibrant community with a deep knowledge of the war and a great place to explore aspects of that history. There has been an on-going discussion about browsing the diaries on the Talk forum. The aims of this project are restated above and they do not include the creation of a diary browser. Operation War Diary is built using the powerful Zooniverse crowdsourcing platform. This is designed to present a series of images for classification and tagging by volunteers and to optimise that process. However, it is not designed to be a diary browsing tool. We appreciate that some people wish to view the whole diary. You can download full diaries from The National Archives, for a very reasonable fee. There are no charges for visitors to their reading room at Kew and there is also free access in many libraries and universities. The work done by volunteers has been beyond our expectations. I look forward to sharing some of the data with you very soon. People often tell me how much they enjoy tagging the diaries and how it enriches their understanding of the war – I know its enriched my understanding. Please keep it up – the work is incredibly valuable as the aims make clear. Please join the conversation on Talk and encourage others to do likewise – whether they are new to First World War history or professional historians. Everything you do matters to public understanding of the war and you are making a contribution its centenary. How can you and others encourage more people to join the conversation on the Operation War Diary Talk forums? Tell us in the comments below. 116,638 names tagged in first week! Peak concurrent users, approx 1,000 on Tue 14. Approx 1 person year of effort spent on Operation War Diary site. Wow – thank you to all the citizen historians who made this possible! This is far beyond what we expected for our first outing. Operation War Diary uses the Zooniverse platform to present large volumes of data (approx 1.5 million pages) for classification and tagging. This approach has been used for some time in Citizen Science — find out more at Zooniverse.org. However, this is the first pure history project to use this approach. As this is a first, there are many unknowns. The main one was “would people volunteer as citizen historians?” We now know that many of you are willing to help us and be part of history – that is essential, and knowing that we can make Operation War Diary even more effective. We can now proceed to refine the available tags and continue to enhance the classification and tagging interface. Several people have asked us to explain more about why we are using this approach for citizen history – I hope the quantity of data gathered already begins to answer that. We’ll be addressing this in more detail very soon. And some of you may be wondering why we haven’t addressed every query already – good question! We are a highly dedicated, but small team spread across 3 organisations. We have decided to focus on enhancements to the system in the first couple of weeks. We have already addressed a range of issues that some volunteers experienced in the first week. We also have lots of other exciting projects that overlap with Operation War Diary and these have also required some of our attention. This is is a long term project – its going to take a long time to tag all 1.5 million pages of Western Front War Diaries! So there is plenty of time for us to learn, improve and reach more citizen historians. Finally, Citizen History is a two way street – the volunteers must get at least as much out as the effort they put in. My own experience of doing Operation War Diary with my daughter tells me that this work gives us a fine-grained, close-up view of the Western Front. It makes us think about the war in ways we never did before and leads us on to learn more from other sources. Chris Lintott, Principal Investigator at Zooniverse has a wonderful phrase for this, he describes it as an “engine of motivation,” in my home this is certainly the case. Who else out there is learning while they help us? Please tell us about it in the comments below. Welcome to our project blog. I’d like to get the ball rolling with a few words about why Imperial War Museums (IWM) brought The National Archives and Zooniverse together and then led this project through conception, design and development. Of course IWM and The National Archives work closely together. The National Archives have digitised and are making available First World War unit war diaries through their First World War 100 portal and they were helping us plan our major digital project for the centenary – IWM’s Lives of the First World War . That project, due to launch in late Spring, aims to uncover the life stories of the 8million men and women who served Britain and the Commonwealth during the war. The unit war diaries can help to tell many of those life stories. A colleague told me one of those stories that she found in a battalion war diary. A story about the wonderfully named Reverend Mazzini Tron that she found in a battalion war diary. This is a memorable incident, but there is a wider point. Thrice decorated, Rev Tron was clearly a dynamic individual, yet we know little about his war service – why? Because his service records were destroyed by bombing during in the Second World War, along with around 70% of FWW service records. It is very, very likely he is mentioned elsewhere, but how can we find him in 1.5 million pages? Along with Rvd Tron, there are thought to be around half a million people named in the diaries, but how do we find those names? That’s where Zooniverse come in. My job is to apply new technology to the history of the war, so I already knew about the innovative Zooniverse crowdsourcing platform and their successful citizen science projects . Chris Lintott, Zooniverse Supremo and presenter on BBC’s The Sky at Night, and his team were immediately enthusiastic and wanted to work with the National Archives and IWM, but they told us we needed to underpin the project with formalised academic rigour. From experience, they knew this would give it real purpose and broaden its appeal. I then approached Professor Richard Grayson of Goldsmiths, University of London. His book Belfast Boys pioneered using large quantities of digital and other sources to analyse the war experience of one area. Richard was supportive from our first conversation and he helped IWM to convene a 25 person Academic Advisory Group for centenary digital projects. Together, we have done something extraordinary. We have created operationwardiary.org – the most ambitious project of its kind to date. Now for the really important stage – we are seeking thousands of citizen historians to find all the references to Rev Tron and the other half a million named people. Together we can uncover the story of the Western front in new and extraordinary detail. By working together, we can make history.